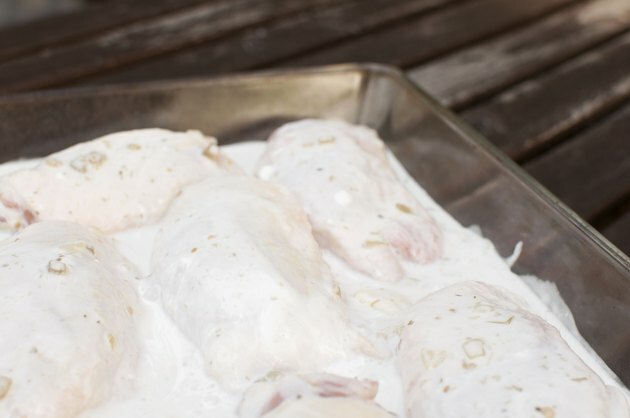 Soaking chicken in buttermilk produces moist, tender meat with a flavorful tang. Buttermilk is traditionally used as a marinade for bone-in fried chicken, but it can also improve your pan-fried chicken breasts. Boneless chicken breasts cook faster than bone-in chicken and can be served on their own, or used as the basis for sandwiches, chicken Parmesan and other dishes. By preparing and marinating the chicken the night before, you can make an easy and quick meal. Rinse thawed or fresh chicken breasts. Cut into evenly sized pieces, trimming away any fat or discoloration. Place the chicken in a resealable plastic bag. Pour 2 cups of buttermilk into the bag and seal. Shake lightly to coat all the chicken pieces with buttermilk. Put the bag in the refrigerator for at least eight hours. Remove the chicken from the buttermilk marinade. Season liberally with a mixture of salt, pepper, garlic and paprika, or your favorite salt-based seasoning blend. Dredge each chicken breast piece in flour on both sides. Add enough shortening or oil to a large skillet to reach 1/8 inch to 1/4 inch up the side of the pan. Bring the oil to 325 degrees Fahrenheit. Put the chicken in the skillet. Cook for six to eight minutes per side, until the meat reaches an internal temperature of 160 degrees Fahrenheit. Add cayenne pepper for additional spice. Avoid overcrowding the chicken in the pan.